Avast me hearties! 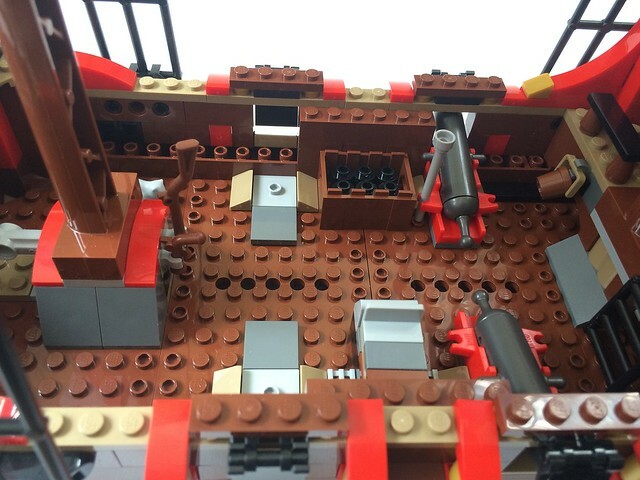 It gives me great pleasure to bring you the Brickset review of the 13th official LEGO Pirate theme ship (and for those of you who can remember each one, congratulations, we are officially old...)! 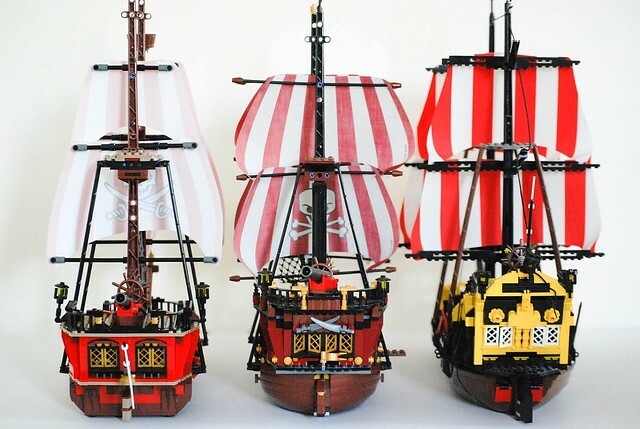 With such a magnificent fleet preceding, how will the latest installment, The Brick Bounty, fare when she goes head-to-head with the great galleons and frigates of yesteryear? I am a confirmed LEGO Pirate fanatic. The most glorious eight feet in my house boasts every ship from the LEGO pirate line on permanent display in my basement, and almost every major set from the theme released over the past 25 years exist in various states of assembly, so I've trawled the depths of LEGO Pirates past and compared her from flag to floorboard with her predecessors. 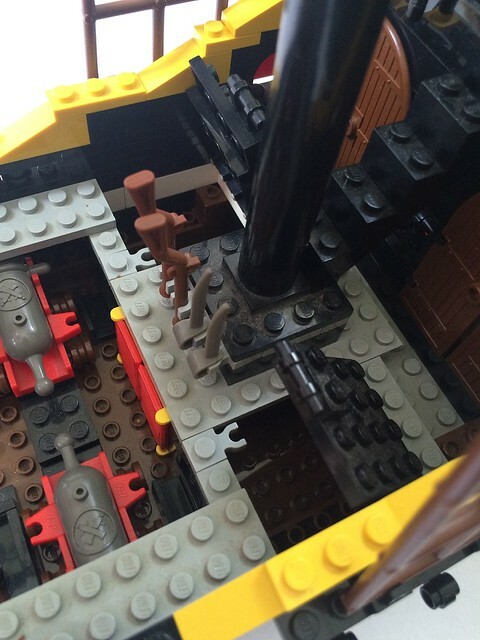 Sets from LEGO Pirates are fun and unique to review because of the rich history. LEGO has produced few other types of sets with so many different versions, outside of police and fire stations. Even in the Star Wars world, which is known for rehashing old material, I don’t think any vehicle can claim more than five incarnations. As I said in the intro however, LEGO has released 12 previous ships. 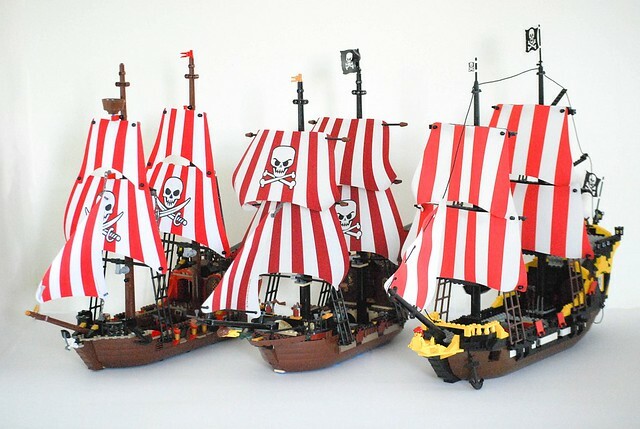 The designer clearly drew inspiration primarily from two sets: The original Black Seas Barracuda (6285) and the previously mentioned Brickbeard’s Bounty (6243). In regards to the Barracuda, they could not have chosen better as that set is the perfect pirate ship. With that in mind, I grabbed both of those ships, cracked open the box of 70413, and got building. Upon opening the box I was greeted by a scene that is pretty much exactly what you would expect nowadays in a LEGO set. The box contains six numbered bags and one unnumbered one which holds the masts and bow. The remaining hull pieces are loose, and the instructions and sails are safely housed in a cardboard backed bag. 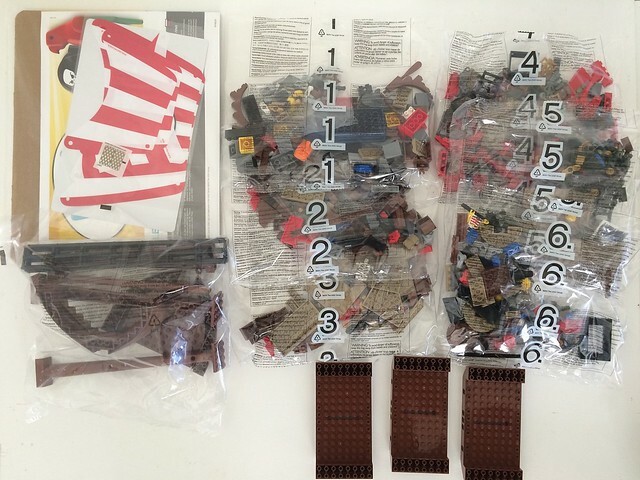 I think I can safely say that we have all appreciated the separate protected bag for the instructions that LEGO began including on larger sets a few years ago. However, I now appreciate them even more as this is the first time I have encountered one in a set that contained cloth. LEGO went a step further by putting the sails in a separate bag with cardboard backing contained within the larger instruction packet. The sails arrived crisp and clean in contrast to the old days when sails came loose in the box, often arriving folded, or even already creased. This is a fantastic improvement. Confession: I do not understand the minifigure craze which has engulfed the LEGO world in the past few years. Growing up in the 80s and 90s, minifigures were utilities, essential in terms of their functions as pilots, firefighters, or divers, but largely interchangeable. We also get a re-boot of the Blue Coats! This set includes three, one of which is the new admiral. He can be seen below along with his two predecessors. Does anyone else remember the original Governor Broadside? In all, a respectable 7 minifigures are included with this set. With three crewman and the Captain the Bounty can be fully manned, and three Blue Coats it makes for a relatively even fight provided they can get aboard. Older Pirate ships were notorious for their complexity. In light of that I laughed when I looked at the instructions for each of the three ships side by side. 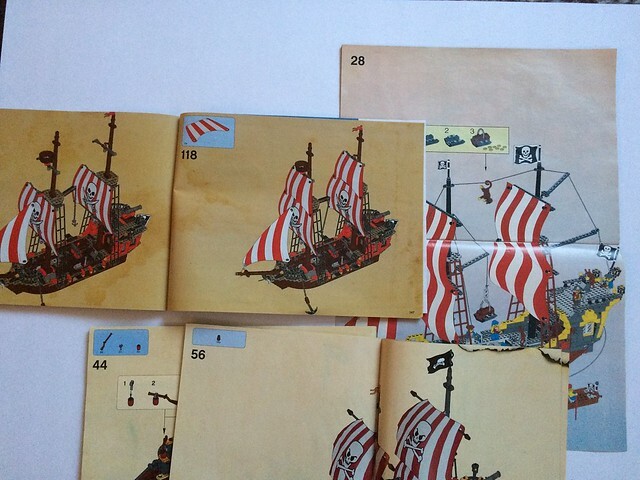 The Black Seas Barracuda of 1989 has about 200 more pieces than either of the Bounties, however, its instructions manual contains only 28 steps, while each of the Bounties have over 100 steps apiece. In light of the hand holding, I decided to do an experiment. I passed the unassembled ship over to my daughter who just turned five. To my amazement and pride she completed the entire assembly herself in just two hours. Suffice it to say the build is not challenging, but it also contains some delightful surprises and is never monotonous. I got my first major surprise when I placed the completed 70413 next to the other two ships. She was noticeably smaller than both of them. I was expecting her to be smaller than the Barracuda as most ships are, but was not prepared for how much smaller she looked than Brickbeard’s Bounty! I was anticipating that they would be comparable. 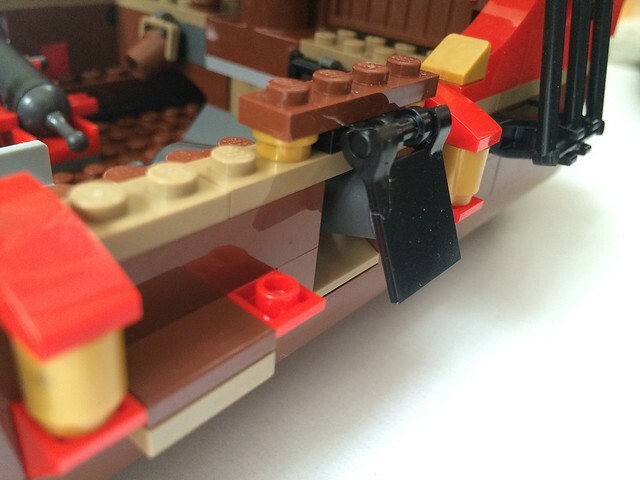 The 70413 uses a technique that LEGO employed with the Black Pearl from the Pirate’s of the Caribbean line. 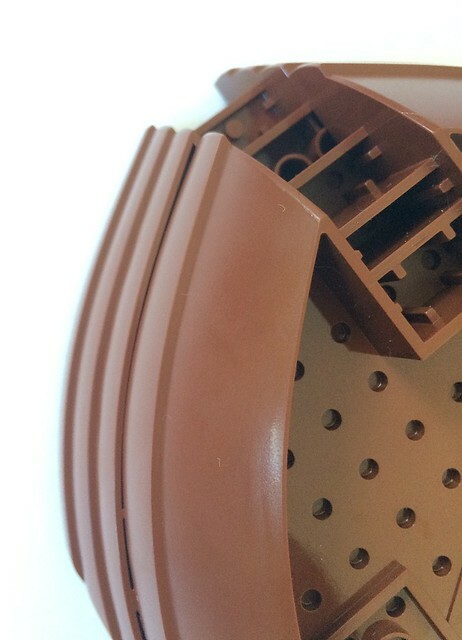 Prior to that set, every LEGO ship used a large bow piece on each end connected by “middle hull pieces”. The number of middle hull pieces was therefore used by us Pirate enthusiasts to classify a ship’s size. 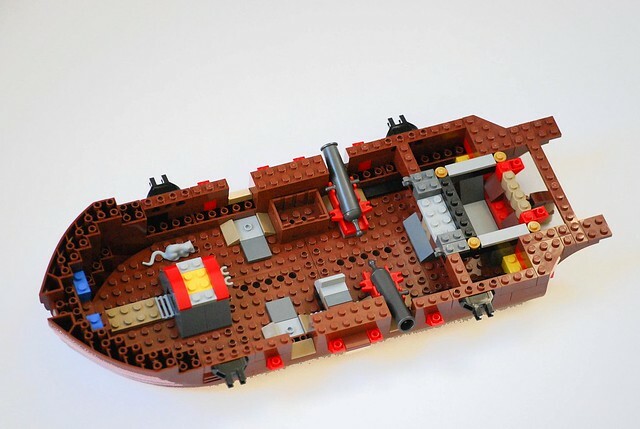 To save on production dollars, LEGO broke with that trend on the Black Pearl choosing to build the rear cabin directly onto the rearmost middle hull piece. They use the same technique here. 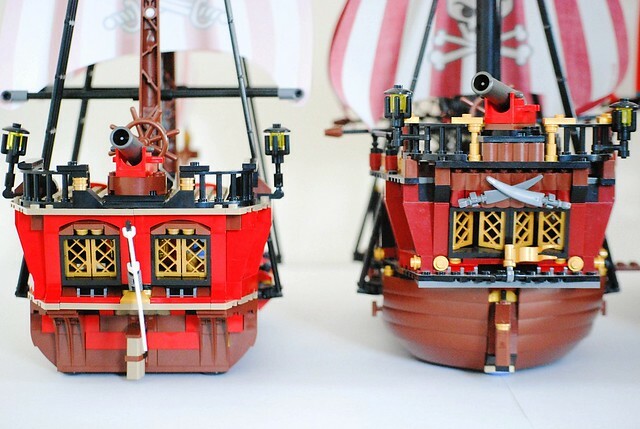 A cynic might dismiss this as LEGO simply cutting cost at the expense of the consumer, but the end product is much more true to the look of an actual ship than Brickbeard’s Bounty which employed identical hull pieces on both the front and rear. The Barracuda and all older ships had different front and rear hull pieces, but that changed years ago to save production dollars of two different components. I strongly prefer the final look of the rear on the new Bounty. The one downside is height, as can be seen in the following comparison shots. In light of the noticeably shorter cabin I was surprised to discover that 70413 is actually a bit taller than Brickbeard’s Bounty though predictably shorter than the Barracuda. This slim victory is due to LEGO fixing one of the flaws plaguing the four most recent pirate ships: column pieces as masts. 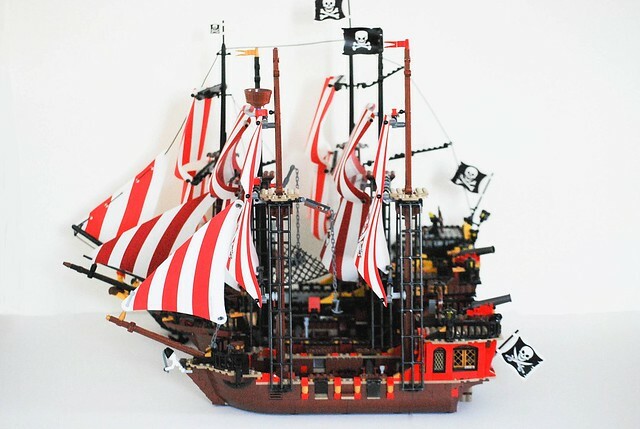 The problem is that column components have no anchor points for the rigging, which led LEGO to use several different approaches with varying degrees of aesthetic success to mount sails to the masts. The work-around on the 10210 Imperial Flagship looked fine, but on the other three, the technique LEGO used looked forced and tended to be fragile. 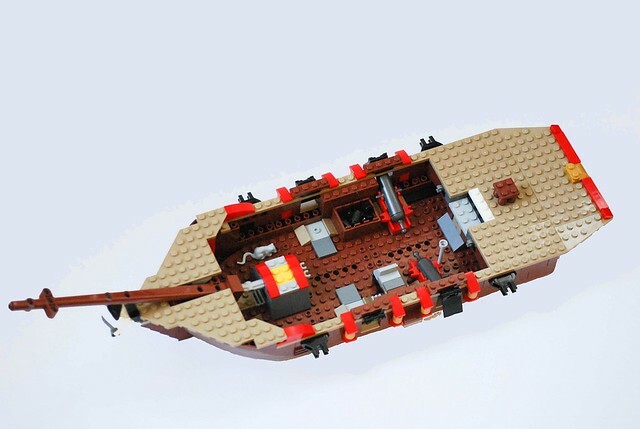 For 70413, LEGO has resurrected a piece that was used in the short-lived Pirate Juniors line and last appeared on set 7018 Viking Ship – a solid single component mast with rigging points and nice wide 4x2 base. 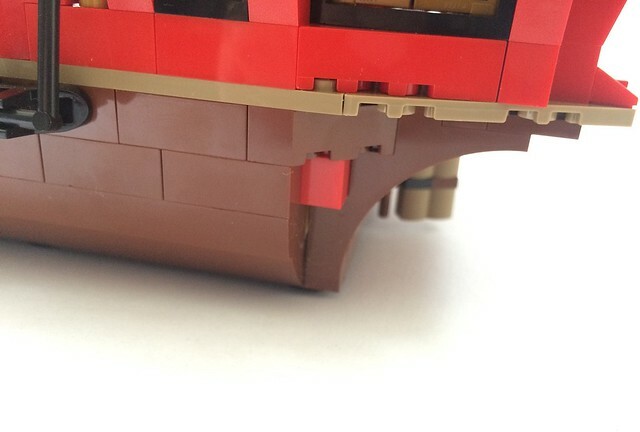 In the picture below you can see this new mast piece alongside the columns used on Brickbeard’s Bounty and the old style masts used on the Barracuda. In terms of length 70413 appears to be markedly shorter than 6243 Brickbeard’s Bounty but that is only because her forward mast is mounted much further back. In terms of hull length, they are almost identical. However, since the jib is mounted to the protruding mast and therefore sits farther forward, 6243 looks noticeably longer. The Barracuda is longer than either Bounty as she has one more middle hull piece than both of them, which gives her an 8 stud advantage. 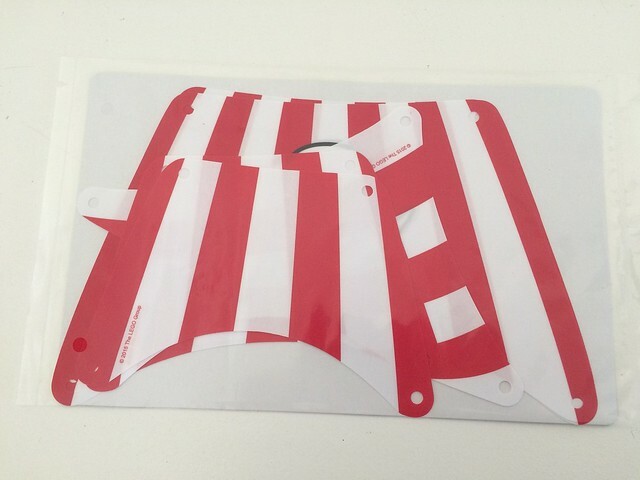 My one major disappointment with 70413 is that it comes with printed sails. 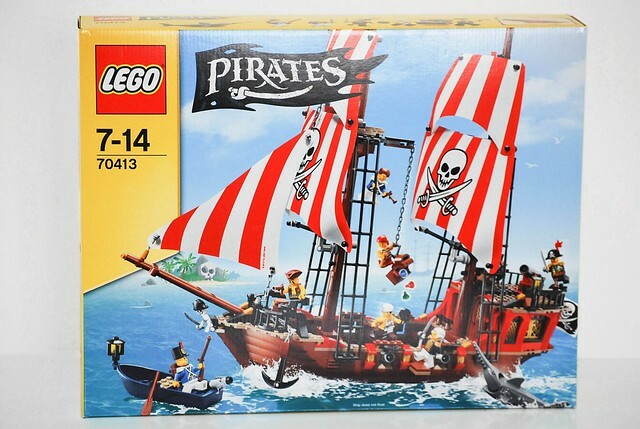 I was hoping that Lego would continue with the plain or neutral printing that appeared on the Pirates of the Caribbean sails and 10210 before them. Sails that don’t define a ship’s allegiance are great, as that means it can be used as a pirate, imperial or neutral ship simply by changing the flags. Fortunately, the emblem is not quite as cartoonish as the printed sails that came with Brickbeard’s Bounty, but I won’t lie – its close. LEGO introduced a new size of sail with the Pirates of the Caribbean sets and they put it to use here. I really like the look of this smaller sail paired with a larger one. It harkens back to the shape of the original topsail on the Barracuda, but covers about half the area. At first I thought this would look bad but found upon completion, that it actually improved the look of the ship as it gives her more realistic lines. 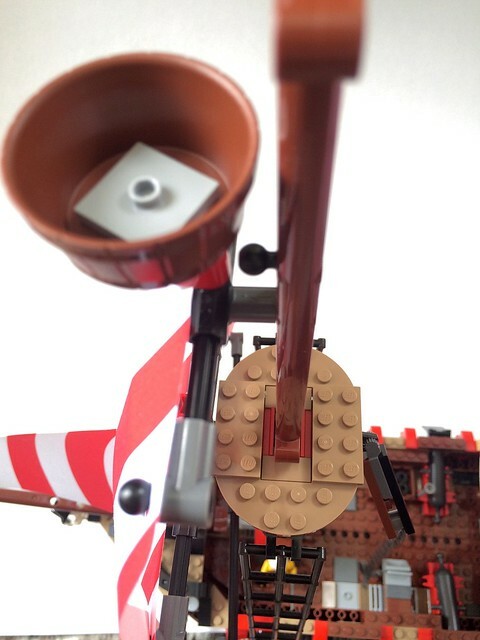 It also allowed LEGO to raise the sails higher on the masts which give 70413 a distinctive look. 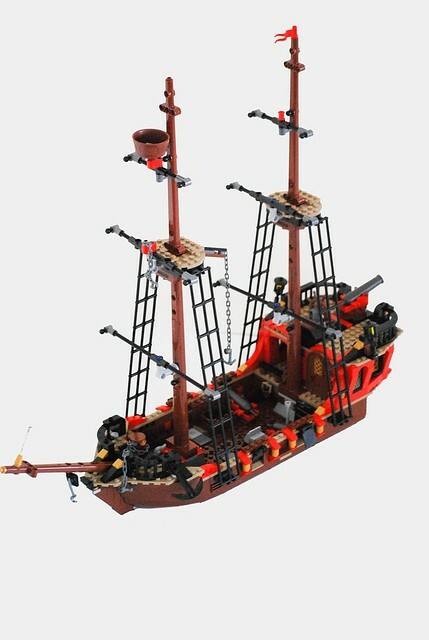 70413 most solidly beats 6243 Brickbeard’s Bounty with sail rigging. The original Bounty used rigid hose pieces to mount the sails and it just looked awful. Hose pieces are too thin; they warp and bend at the slightest touch. This is one cost savings shortcut that I am very thankful LEGO didn’t make. 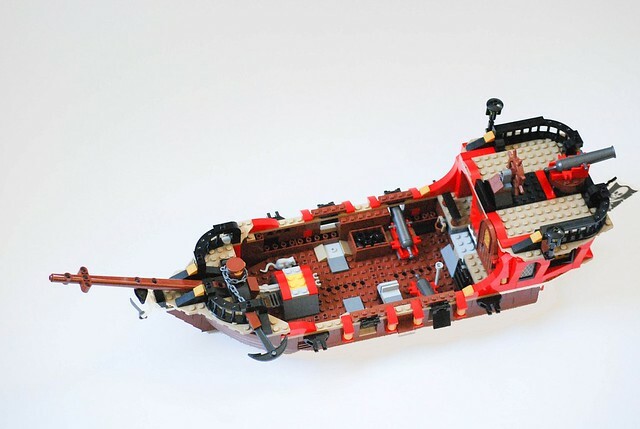 70413 Brick Bounty uses the technic axles that were introduced on 10210 and continued in the Pirates of the Caribbean line. The old-school brick built rigging will always be my favorite because those old masts look like they have the right heft. You can check them out below next to the hoses from 6243 and the rigging from set 70413. The biggest difference between the old and new pirate ships is decks. In order not to sacrifice the overall size of the ships, LEGO has steadily dialed back the size, number and detail of the decks and internals. Whereas the Barracuda has a proper gun deck, working holds, and three levels of decks, the original Bounty from 2009 had none, save for the poop deck at the rear. Thankfully, LEGO did not skimp as much with 70413. While her internal structure does not come close to competing with the Barracuda, she has a forecastle and a working anchor, the omission of which was a glaring problem with the original Bounty. My biggest beef with her decks has to do with the cannons; they don’t have wheels. This was one of the things I hated about 6289 Red Beard Runner. Unless the cannons are mounted on turn tables as in 6285 Skull’s Eye Schooner, or the rear of both Bounties, I believe the cannons should have wheels. 70413 mounts the cannons straight to the deck by a single stud. They are easily removed so they can be mounted on the opposite side of the ship, but still look odd without the wheels. There were several other great features of 70413 that I will briefly cover here. The biggest surprise of the build for me lay beneath the floor of the cabin. 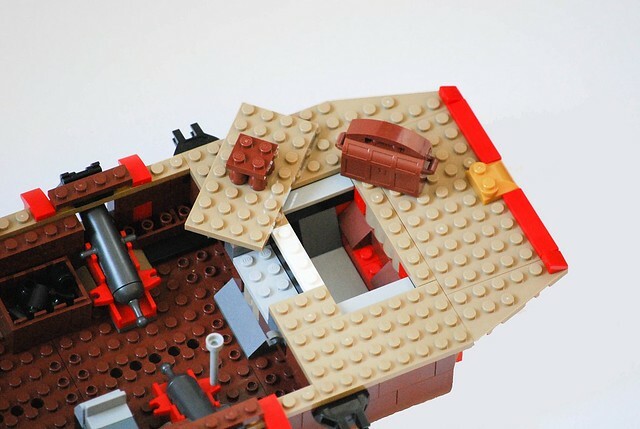 A perfectly concealed compartment for stowing the treasure chest can be revealed by pulling up a removable floorboard. This is a feature that is completely unique to this ship. 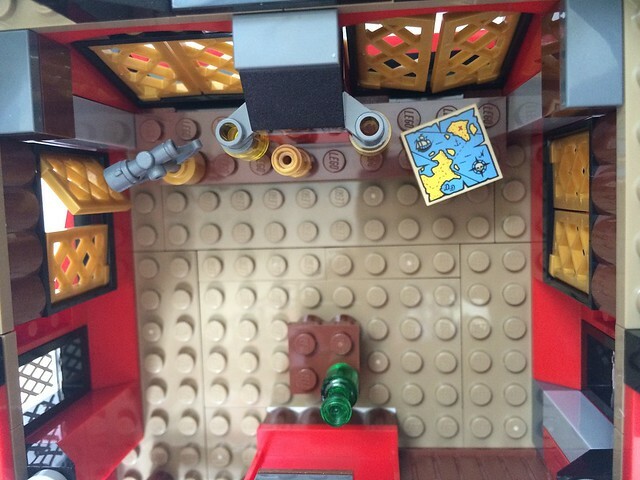 A minifigure can also hide down there, which gives it even greater play possibilities. 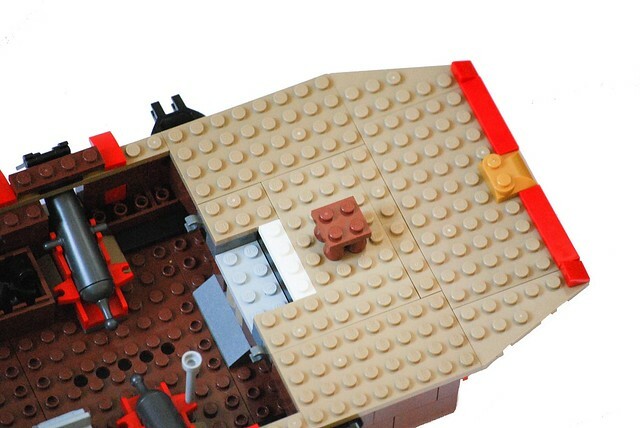 LEGO has experimented with crow’s nests on all of the most recent ships. I thought the ones on the original Bounty too small, and the designer of 70413 must have agreed. Through the use of some new curved elements, the ship has two very respectable rounded lower crow’s nests and a third even higher one on the rear mast via a mounted bucket. Having pirates swing from these high perches was one of my favorite things to play as a kid, so these new crow’s nests are a welcome sight! The captain’s cabin of this ship is excellent. LEGO set a high bar with 10210 which included a full organ. 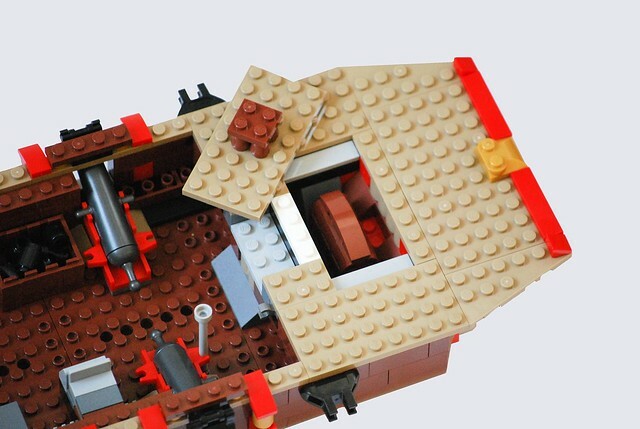 However, compared with similar sets, this is one of the best cabins LEGO offers. The rear includes a full length table which looks great and they included a map (also modeled after the original map from the 80s!) a sextant, and some lighting elements. I hope that I have been clear that I like this set a lot, but there is always room for improvement. On the rear of the ship where the support structure for the cabin is constructed, LEGO elected to use red 2x4 bricks. Every surrounding piece is brown so when you look at the ship from the side there are odd red islands amidst a sea of brown. 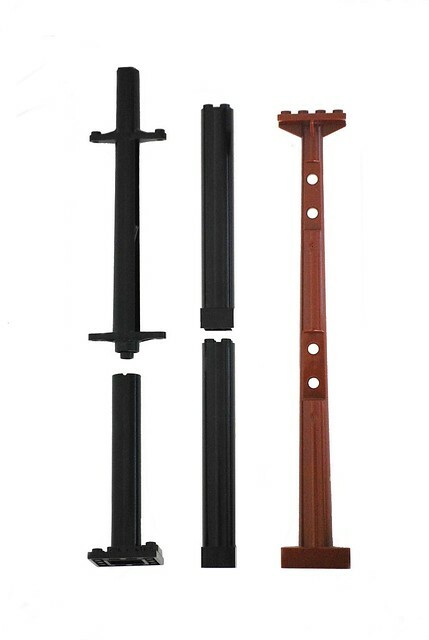 There is no reason that the red 2x4s could not have been brown, improving the overall look. The molding of the top part of the front hull piece is faulty, it doesn’t quite line up with the bottom. I checked my other ships that use the same pieces and they did not have this gap. Perhaps it was a bad production run? I would be curious to know if anyone else has this problem. My complaint about the wheels is not wholly personal preference. Due to mounting the cannons directly to the ship they cannot be pulled back. Because of that, the portholes for the cannons cannot be closed when they are in place. If you try, they get hung up on the cannons about halfway between open and closed which looks terrible. As none of the other recent ships have included it, I recognize that hoping for holds was wishful thinking, but those were one of my favorite features of the older ships. The Barracuda has four holds accessed by hatches. They were unfurnished and actually very hard to use since it was difficult to get your hand in to retrieve any minifigure you stashed in there, but it made the ship feel so large. The original Bounty somewhat mimicked this by including a hold designed to be accessed by popping off the captain’s cabin, however, this most recent incarnation has no approximation. You want a set with incredible playability that will lead to hours of contented play for yourself, or for a kid/grandkid. If any of those are you, I unreservedly recommend this set. 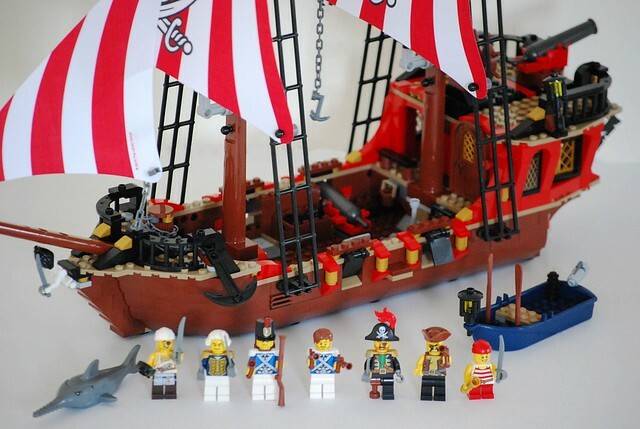 70413 falls squarely in between The Black Seas Barracuda and the Brickbeard’s Bounty. She is not as good of a ship as the former but she is definitely an improvement over the latter. However, it is in many ways not even fair to compare her to the Barracuda. In 1989 the Barracuda cost $110, which in today’s dollars would be $210; double the cost of 70413. What LEGO has given us for $100 cheaper is truly amazing. My hat is off to the designers for making so much with comparatively so little. 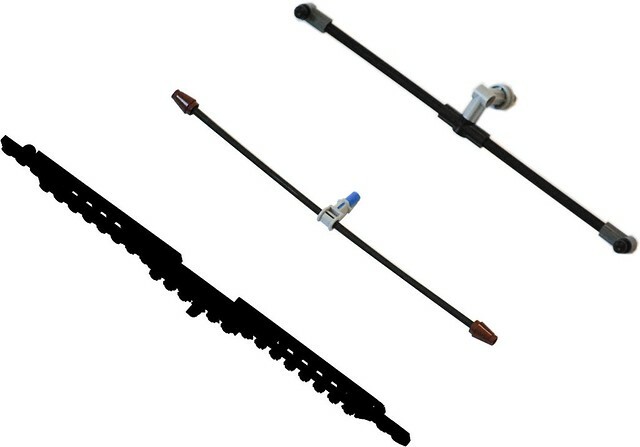 This is an excellent set that I highly recommend to you, especially for the price! Many thanks to the LEGO CEE team for providing this set for review. 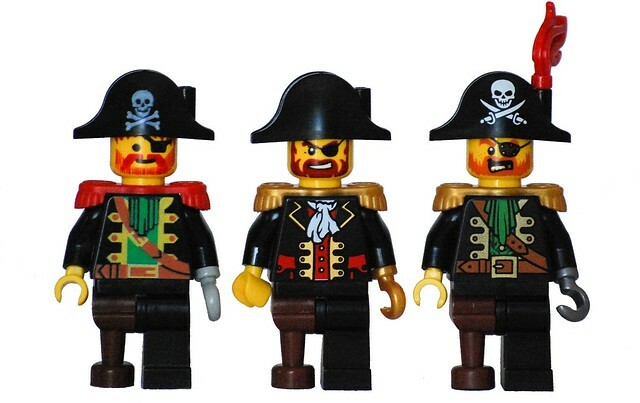 For me Pirates and Castle are the creme de menthe (Del Boy Talk) of the Lego world and like yourself remember back to the first wave of pirate sets and have tried to buy every one since. I know I won't be able to resist these!! Thanks for a great morning read. Excellent review. Not enamored with the color scheme, sails, and lack of rigging but I'll be picking this up either way. Thanks for another great review. Doing the comparisons answered all the questions I had about the set and your observations were very insightful. I love these pirate torsos, especially the cook's one with the fishbone and hairy chest. But Redbeard had brown epaulet, not red. The cabin boy would be well advised to get a pair of safety glasses asap. Every other pirate has an eye patch and I fear he will soon follow the same fate. I like a child pirate as a new addition, but the lack of female members (mermaid counts) looks like a back-step from the previous version. Great review with comparing every generation of the pirate ships (though also showing the "progress" of LEGO themselves). This is an absolutely fantastic review! All the history, comparisons, and photos truly show off your love for the subject matter. I am a pirate fan first and foremost as well. Despite the obvious juniorization of the 5 new sets, I had to own them all. It's just nice to see this theme return again, even if the sets aren't perfect imo. Either way seeing pirate LEGO sets on a retail shelf really takes me back to the good old days. Once again, incredible review, Thanks for sharing! ^^I agreee; 4 pirates (and one is just a kid) is not nearly enough figures for a full-size pirate ship. The need to include the bluecoats (and admiral? in a pirate ship set?) 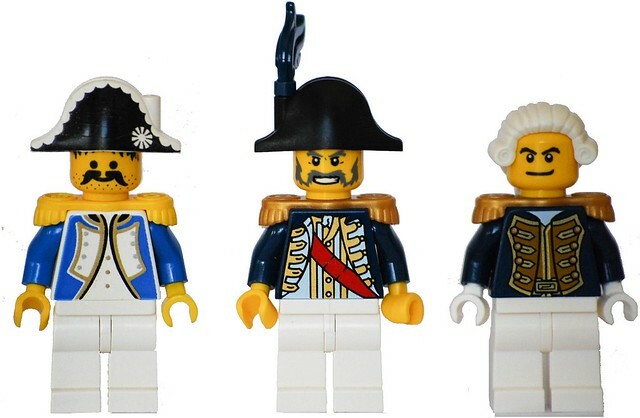 explains the shortfall in pirate figures, but if LEGO would just realize that an imperial ship is needed in the theme and produce one already, then the bluecoats would get their own ship and the pirate ship could be properly manned. Does LEGO think that the success of the previous line mean that the exact same sets should be produced for the follow-up line? The best pirate lineup should include a big ship for both pirates and imperials, and at least one base set for each, plus a couple of smaller sets. It's a nice-looking ship, but it just looks... Cheaper than the Bounty. There aren't wheels on the cannons, the front section of the ship is almost nonexistent, and the "captain's cabin" is where the hull should be. I thoroughly enjoyed your review. Thanks for a great write up. Thanks for the great review. 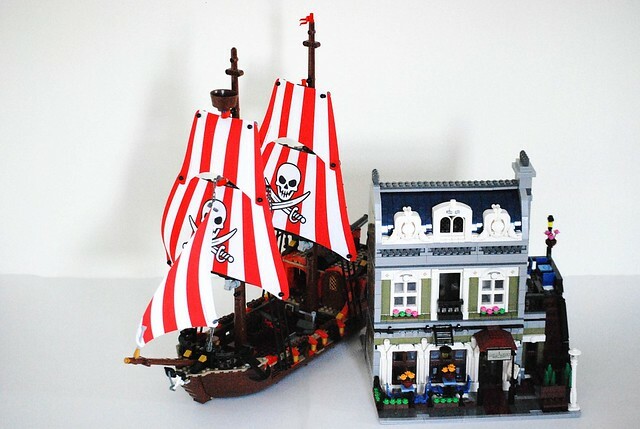 I collect only City sets, but the urge to buy some of these new Pirates sets is getting stronger, and stronger. Thanks to everyone for the positive feedback and for reading my review! @MrsEspo12774 I do indeed have the Sea Cow. I will take some comparison shots and get them posted. As several of you have mentioned the main hole in this wave is the lack of an opposing ship for the Bounty. Hopefully Lego has another surprise for us like they did last time with the Imperial Flagship! This seems like another one of those sets where Lego has given us a very good start, but left a few details for us to finish. All the things you've nitpicked look easy to fix, which I don't mind as it will let me put a personal touch on the ship. I plan to buy this and make a few modifications. I should be able to get all the parts I'll need from 70409-70411. I'm honestly disappointed they didn't do a remake of a much older pirate ship like the Skull's Eye Schooner or Red Beard Runner. Instead they rework the Brickbeard's Bounty which came out just six years ago, which to me isn't too long ago. If Lego is capable of remakes, I really hope a re-release of the 1989 Caribbean Clipper is currently in the works. Simply reworking the 2010 Imperial Flagship for the bluecoats is just too soon. Fingers crossed. I'd be hard pressed to tell the difference between the two most recent ships, even though I have the earlier one still assembled. I too have a collection of Pirate ships and Navy, when I saw the 2009 version it just felt like a cheap version of the "Imperial Flag Ship"... this does too. Enjoyable but I'm in it for the build and display. There's space enough on my shelve for one more ship set, I think I'll wait. Nice review through, looking forward for next year when they'll bring out the bigger sets. They include figures of both sides to be able to have play value. Not every kid will get every set. I agree, it would make more sense to have two competing ships with the designated figures being solely with their ship, but I don't think that would sell well. Otherwise, the review is exactly as I expected. It looked a lot like the previous version (I actually think I like the previous version more). I don't own any sets from the previous Pirates line, but I did buy IFS and ALL of the POTC sets and I rather liked them. I even MOCed my own Skull's Eye Schooner and much prefer that to the original. BSB is a great ship and it will always be above and beyond anything LEGO tries to do in System again I would imagine. The shipboy is obviously a reference to the "Willy" character from the pirates comic book. Nice move here. Thank you. I had the Barracuda as a boy so I enjoyed the comparisons you made. Love the pictures too. This Review made me want to have this set even more, since the only Pirate ship I ever owned was Renegade Runner, which didn't even had steering wheel.... Anyone knows when It will be avaible in Poland? 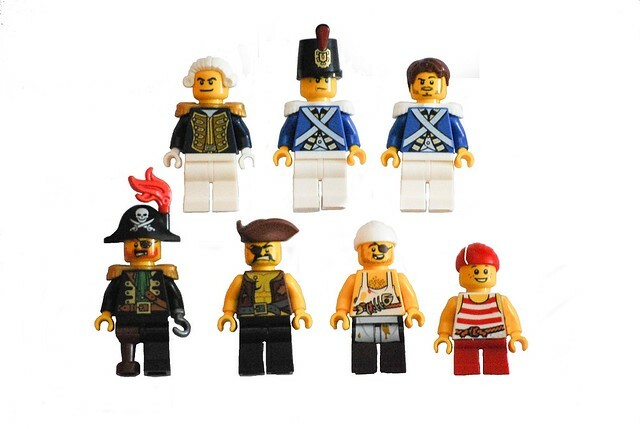 I also plan to get Treasure Island, or Pirates Chess, just for Female Pirate, and more Soldiers. And about the Cannons, you don't really need wheels, You can switch the 2x2 jumper plates with 2x2 tiles, so you'll be able to place cannons further to the inside of the ship, so you can close the portholes. Out of curiosity, is the bow on the wig piece for the admiral dark blue like the one found on #71001-12 or is it black? Thanks again! That was an interesting read. 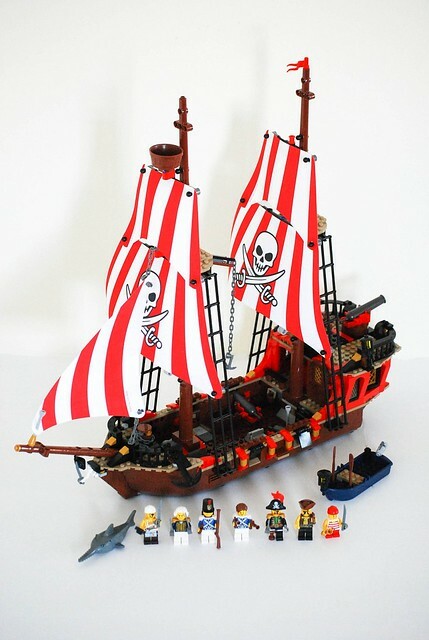 I had just a couple small lego Pirate sets as a kid(90's kid) but never got one of the full blown ships. Do you think this set will ever go on clearance? i think it might be one of those sets I'll snag up in a heart beat if I can find it on clearance or on Ebay, but I detect this will be a sought after set and that's unlikely to happen. Maybe I should just nut up and pay the full price once it's on shelves. I can always sell the Minifigs later to you guys to recoop some costs. Love the comparisons with older models, great work! @monkeyman3838 - yes they are new caps, not super different but definitely new molds. @yamaki - you are absolutely right, great catch! I had totally missed that shout out! @eggyslav - you are right on about the way to fix the porthole problem. My desire for wheels is more rooted in playability. As a kid I would often have the Pirates offload the cannons for island showdowns. Harder to do without wheels. @rogue10 - I had posted a pic awhile back in the forum, only ship missing is the new Bounty. @bovinebrick - it is black. Great review! I loved how you compared the new ship to the older ones. I don't have many Pirates sets, but there's something about them that I love. Great review, especially the comparison to the older sets is not only helpful, but was also an awesome trip down memory lane. Thanks a lot! Great reveiw!!!! 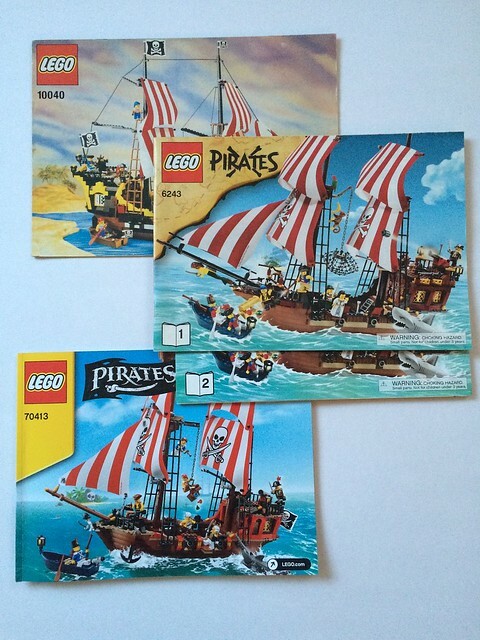 Will be looking forward also to adding this set to my Pirates collection to compete with my 6243.............. Yeehaw!!! One thing to add to the "nitpicking" list that bugs me to no end - the sails being one-sided (not too bad, but come on) and the copyright printed on each sail. I get that every piece has the Lego logo all over - of course it does - but such visible legal markings really take me out of the experience. Admittedly I don't know how copyright law works, but if you left that off of the masts, would it really matter if someone successfully stole THAT part of your design? Excellent review, inspired me to purchase this set from Lego shop. Great comparitive photos as it answered a lot of questions I had. With that said this set looks closer to the black pearl with exception to the colors. Can you also do comparative pictures with the pearl as it would be interesting to see both of them side by side. Thanks again for an epic review. @deadeyedave - I heavily modified my copy of the Pearl to make the rear more accurate and I changed the front as well so it wouldn't be an accurate comparison as mine is so different. You are right though that the Pearl as produced is very similar in construction to this, just looks so different due to the color scheme. P.S. There must not be much wind on those seas, as your deck is dirty. Man, what a great review! I loved the side-by-side comparison of the three sets. 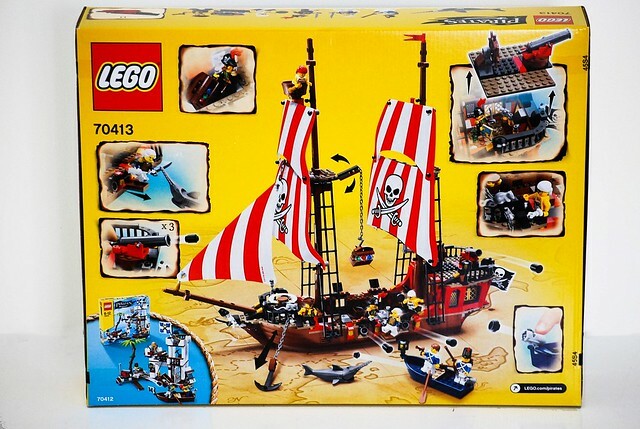 I was originally going to pass on this set because I figured it was almost an exact replica of Brickbeard's Bounty, but now I don't know how I'll be able to live with myself if I let it slip through my fingers. The problem with the cannons being unable to be pushed back, causing the flags to not close properly, can be fixed with a minor modification. All you need to do is switch the places of the light grey 2x2 jumper with the dark grey 2x2 tile, that way it can be mounted in two places, the original spot and slightly behind it. really wonderful review. loved the detailed comparisons.